Silicone is especially useful because of its smooth edges and sturdiness. They are heat resistant and very comfortable to use! These strong, flexible pastry and barbecue brushes are perfect for spreading butter, oils and sauces in the kitchen, on the grill, on your pastry and other baked goods. 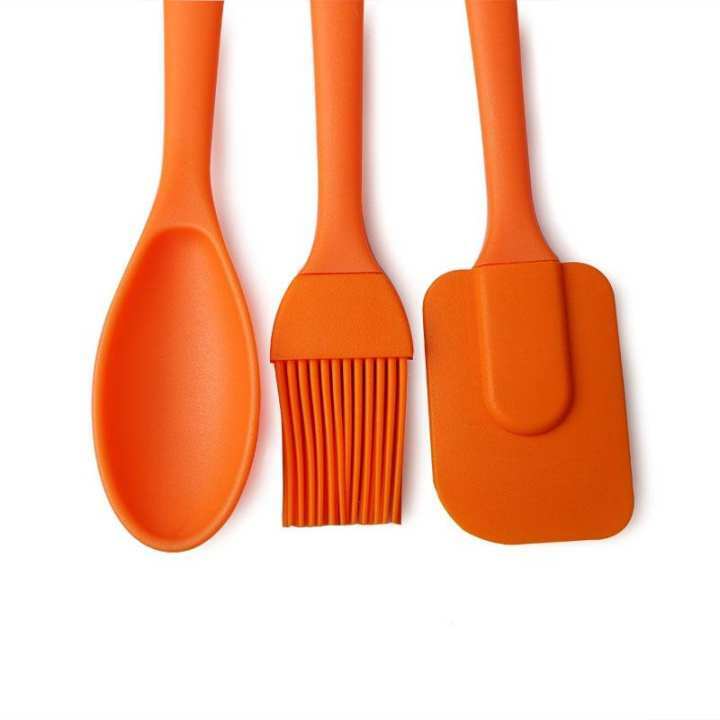 This 3 Pc Silicone Brush Spoon and Spatula Set is is designed to let you handle even the thickest batter with comfort and ease. The handle is oval-shaped and fits comfortably in your hand. it iseasy to use and a pleasure to own. Dishwasher safe. Spatula Set is useful for mixing wet and dry ingredients together, as well as scraping the sides of mixing bowls. Silicone is especially useful because of its smooth edges and sturdiness. They are heat resistant and very comfortable to use! These strong, flexible pastry and barbecue brushes are perfect for spreading butter, oils and sauces in the kitchen, on the grill, on your pastry and other baked goods. They are heat resistant up to 500 Ferahanite , so you can use them directly on hot foods in the oven or on the grill. Coat your grilling meats, shish kabobs and vegetables with barbecue sauces or dressings for maximum flavor.